St. Andrew’s Episcopal School strives to educate the mind, body and spirit of children by promoting academic excellence and social responsibility in a small environment which values faith, reason, and diversity. At St. Andrew’s small classes promote a challenging environment where students interact with teachers and grow spiritually, socially, and intellectually. A strong academic program, enhanced by state-of-the-art technology, includes Spanish, Chinese, music, fine arts, athletics, and library skills. 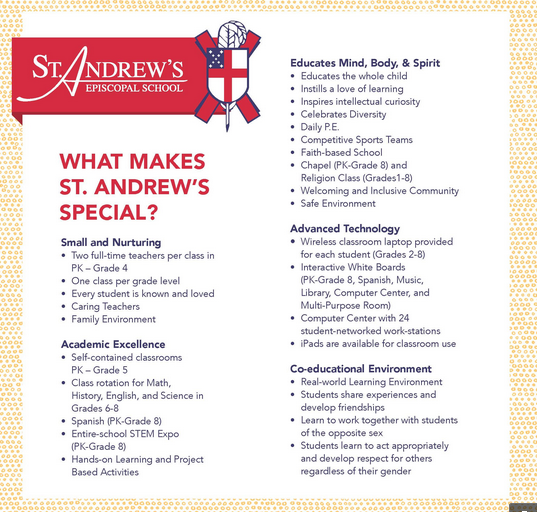 Student publications, dramatics, intramural sports, worship and community service round out the St. Andrew’s experience. Now more than ever, charitable giving is essential to St. Andrew’s Episcopal School. Tuition alone does not cover the cost of educating a student at St. Andrew’s. We seek support from alumni, parents, friends, private foundations, corporations, and organizations to cover the GAP between tuition and the cost of educating a student. The Development Office of St. Andrew’s Episcopal School is charged with the task of raising funds from all constituencies in a variety of ways. Because tuition does not cover the entire cost of providing the St. Andrew’s Episcopal School education, everything our students do is made possible by the generosity of parents, alumni and friends of the school who invest in their future through Annual Giving or a gift to a capital or endowment purpose. Your gift is essential to the successful operation and growth of St. Andrew’s Episcopal School.